What with Christmas less than two weeks away, and the upcoming end-of-year break not far behind, I thought I’d lighten up this week with a series of carefully chosen stocking stuffers for high-tech types. If you’re in a giving mood, you can hand these things out at low expense; if you need some more entries for your Christmas list, you can pick up some affordable ideas that won’t break your benefactors’ banks. 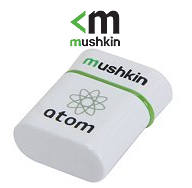 I’ll open with the Atom series of USB 3 Flash Drives from Mushkin. They’re so small that when plugged into a USB port, you can leave them there on a tablet or notebook PC without impeding entry into or exit from a carrying case or sleeve. Capacities range from 8 GB all the way to 64 GB, and they’re reasonably fast (if not on par with top-end UFDs with SSD controllers like Mushkin’s Ventura Ultra line, or even their mid-range Ventura Pro and Ventura Plus lines) and extremely affordable. At Newegg, for example, prices run like this (rounded up to the next dollar): 8 GB/$8, 16GB/$13, 32GB/$15, and 64GB/$25. To my way of thinking, this makes the 32GB version an unbeatable price/capacity tradeoff winner. With the cap off and plugged-in, the Atom sticks out less than 0.25″ (6mm) from the port it inhabits. I own this drive in 8 and 32 GB sizes, and regularly use the smaller one as a bootable UFD for installing various Windows versions (most recently, Build 9879 of the Windows 10 Technical Preview). I’ve used it on various Dell and Lenovo notebook PCs to good effect, and on the Fujitsu Q704, Surface Pro 3, and Dell Venue Pro 11 tablets likewise. You can leave it in all the time, and it never gets in the way when packing it into a Targus notebook carrier or tablet sleeve. And the price is definitely right, too. The only downside is these puppies are so small, it would be easy to lose one (but I haven’t had that problem yet, so you or those who get one from you may be able to escape that fate as well).